Martin Pavlik and Thomas Galle from the Czech Republic produce music that is on a par with many a release from the now defunct Bloodline label. Bombastic synth bursts alongside dark electronics and soundtrack rich compositions steer away from the dance-floor, as much as the individual elements that formulate the initial songs push you in that direction. Come track three ‘Dark Age’, the previous elements I enjoyed are placed on the backburner for the more bog standard, stuck in a rut ‘Hellektro’ fad that a lot of the scene seems to still feel is relevant in some parts of Europe. Unfortunately the majority of the rest of the album follows suit, feeling a tad out-dated and tired. 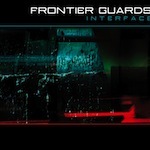 Frontier Guards in a lot of ways have all the appropriate tools to utilise from a shelf in the shed other than the one marked ‘generic’, with the capability of still producing something enjoyable to listen to (as the first two tracks are testament to). Unfortunately, once things started going downhill, the momentum leaning me towards pressing eject was inevitable and there simply wasn’t anything to assist me in dragging this album up from the mire it had found itself stuck in.